“I have been playing the new Sky Guitar every day at home but yesterday I took her to rehearsal for the first time with a full band at real volume levels. We play different styles and genres but I think this is the only guitar that I can use no matter what style I am playing. I am still getting to know her but everything has been beyond my expectations. Read the previous statement below concerning his first two Sky Guitars. “I am going to write a few words describing my personal Sky guitar experience. I am fortunate to have become acquainted with Uli Roth through the Sky Academy. Although there are many wonderful things associated with the Academy, the pertinent part for this story is the connection to the Sky Guitar. At the Academy, I learned about the unique details of the Sky guitar, of which there are many when compared to existing guitar models. 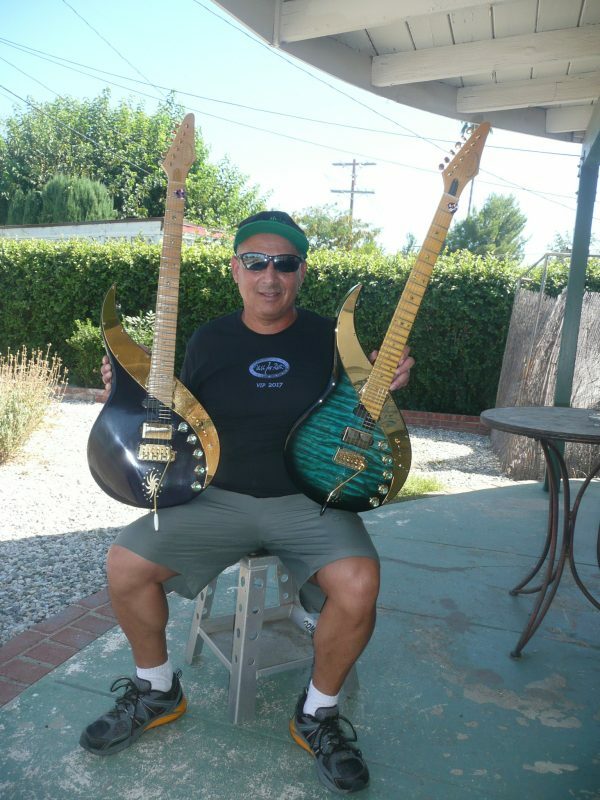 A couple of years later, in 2010, Uli introduced a limited run of 50 Sky Guitars that would be available to the public through Dean Guitars. Being a student, I was given the opportunity to order one of the early models and I obtained Sky Guitar #2, named ‘Night Sky 1’. At this time in production, there was still a bit of experimentation in the design. Night Sky 1 has the scalloping beginning at the 8th fret and also has the bridge pickup wired in a unique way. With the 5-position switch, I can split the bridge pickup to get the side closest to the bridge. This produces kind of a Telecaster sound and the other half produces more of a Stratocaster bridge pickup sound. The pickup wiring was changed on later models, which is described in more detail below. I already owned over 30 guitars of all types when I obtained the Sky Guitar. I quickly noticed that it was very different than anything I had ever played. To make a long story short, the Sky Guitar is very unforgiving. It forces you to pick and finger the strings very accurately. It is very noticeable if you do not. You have to put a lot more into this guitar to get something out of it, which also helps to get more of your personality into your playing. This is not a trivial point. It required me to have a serious mind set whenever I approached the guitar. This is not an instrument to pick up and goof around with after having a couple of drinks – As I did so many times with other guitars. For many months I was a bit terrified of the guitar. It seemed to scold me at times almost as if to say ‘you are not yet ready’. Fortunately, over time it accepted me and I have since used it on recordings and live performances. Note: Setting up Sky Guitars for live performances is also a totally different set up compared to typical guitars. This is a different story in and of itself. As the guitars kept getting produced, the design began to settle down and be more consistent. The bridge pickup described earlier is now wired so that it cannot be split. It is more of a super hum-bucker like the neck pickup and also has a booster switch. In addition, the later models have the scalloping on the neck starting on the 4th fret. The design deviations interested me and I was again in a position to be able to order another model. I obtained model #32 named ‘Symmetry’ which had different scalloping and pickup wiring as described. It also was a mahogany body with a quilt maple top. Night Sky 1 was made of alder. Now I am the lucky owner of two Sky Guitars which are very similar but also have some significant differences. One of the other great things about the guitars is that they are all truly different. Each one is handmade and although they all have an extended fret range, they do not all necessarily have the same number of frets. This resulted in an interesting recording experience. I transcribed a violin solo to the guitar but there was one specific note that I could only play on Night Sky 1 because it has one more fret than Symmetry. Therefore, I had to use Night Sky 1 for the recording. I would have never imagined I would need more frets but music is full of surprises. I now have the opportunity to obtain yet another Sky Guitar, but in this case, very specific design features, types of wood, and electronics can be tailored to a specific user. This is a very exciting opportunity and I hope to be able to write about more Sky Guitar adventures in the future.